It’s the combination of programs that exist and work together. There aren’t enough resources…so we work really hard at working together and filling gaps in creative ways. The county seat, Owego, has a long history as a river and rail trade center. Today, it is a sleepy, quiet area with all the natural charms of a rural locale. Life can be challenging here. Many families live in or at the margins of poverty. Twenty-one percent of youth are food-insecure. Nearly 32 percent of the county’s housing was built before 1939, and a large number of residents live in older, minimally insulated homes ill-equipped to withstand the area’s punishing winters. Basic services are located far from where many people live, making them difficult to access. Yet good things are happening in Tioga County. Collaboration and resource sharing among regional and local nonprofit and government agencies are strong, and large private and public employers are investing in the community’s health. A culture of volunteerism and resilience contributes to local solutions for challenges like food insecurity and transportation. These better-than-expected results are likely influenced by local characteristics and strategies that improve overall well-being. The field work for this case study showed that Tioga County residents collaborate to improve care and well-being outside of core medical facilities. For example, residents have pooled resources to improve access to dental care for children. Many county initiatives depend on volunteerism. Volunteerism is valued on both the giving and receiving ends, and is a critical element of the community health network, especially in helping provide transportation to medical services and prescription pickup. Tioga County represents a metropolitan county in Northern Appalachia. It is one of two Bright Spot counties in Appalachian New York. The population, currently about 50,000, fell more than three percent between 2000 and 2015. Ninety-seven percent of residents are white, and residents’ median age, 43.5, is higher than the national median, 37.8. The population is also relatively well educated: nearly 62 percent of adults in Tioga have some college education, compared with just over 63 percent nationally. As part of the Binghamton metropolitan area, Tioga County enjoys the advantages of neighboring counties’ educational, cultural, and economic development resources. Cornell University is 25 miles from the county center. Although Tioga does not have a hospital, level-one and level-two trauma centers are within a half-hour drive of any location within the county. This compares favorably with many large cities, where traffic congestion can mean longer response and transportation times, even over shorter distances. It may also help explain why Tioga performs better than expected on mortality rates from poisoning, stroke, and injury, which are affected by the speed with which emergency treatment is provided. People in Tioga County consider themselves resilient—able both to get by with the resources at hand and to pull together to recover from adversity. This community self-identification is rooted in a shared history of disaster and recovery. A 2011 flood had a severe impact on Tioga County, including the village of Owego. Photo © Mary Beth Jones, 2017. Because of its location and geography, Tioga County is vulnerable to catastrophic floods. Mountain peaks 5,000 feet high trap clouds and channel rain into narrow river valleys. Just in the past two decades, the county experienced major floods five times: in 1996, 2004, 2005, 2006, and 2011. 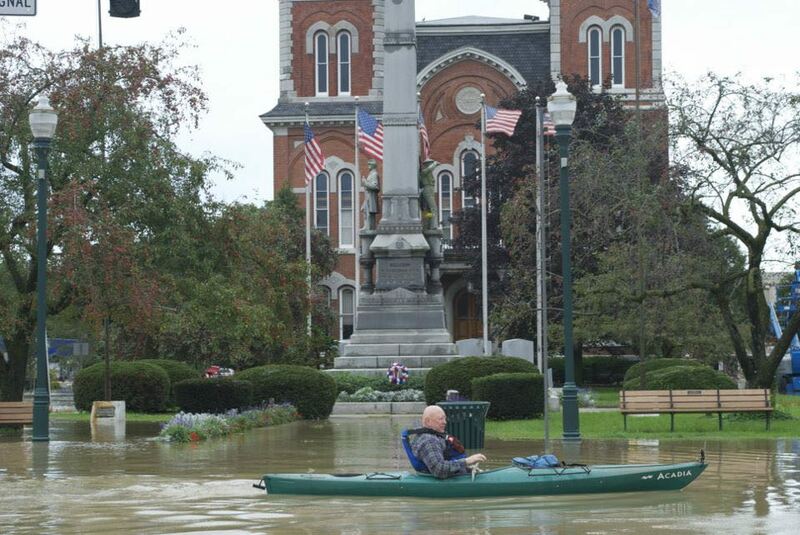 The 2011 flood was the worst in modern times, putting 90 percent of Owego under water. Other parts of the region and state are also vulnerable, so resources for recovery are often spread thin, and local communities must work together to recover and rebuild. Tioga County’s communities have been through this cycle a number of times. Resilience is not just a buzzword here—it is attached to a real history of self-reliant recovery that includes resource sharing and creativity. This history also helps explain the strong culture of volunteerism in Tioga. There’s a sense here that neighbors helping neighbors makes life in Tioga County possible for many people. In many ways, Tioga County exemplifies the word “community.” It is a place where people recognize the need to work together—and are more than willing to do so—for the common good, even when it comes to sharing limited resources and giving up a degree of local or organizational control. Regional and local cross-sector collaboration and resource sharing: Within the county and across the Southern Tier region, cooperation and resource sharing among nonprofit and public agencies produce local solutions to shared challenges, such as access to transportation and food insecurity. Volunteers meeting community needs: Volunteerism is part of Tioga County’s culture. Small and large volunteer organizations are skilled at identifying and resolving issues, setting priorities, and committing resources to address local challenges. Volunteers often step up to fill gaps in government-funded services. Employers that support health as a shared value: Large private and public local employers provide a range of health benefits, including personal wellness services. Over the years, large national companies have established themselves as active community members who view good health as vital. 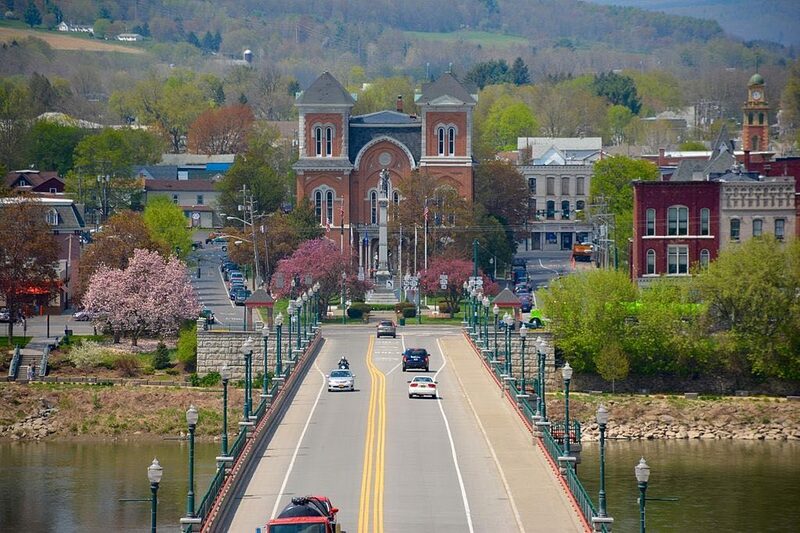 As in the other Bright Spot communities explored in this report, people in Tioga County have worked to elevate physical, social, and economic health in a number of ways. Their approaches fall into three general overarching categories of leadership, cross-sector collaboration, and resource sharing. In Tioga County, leadership is a platform for the collaboration necessary to make the best use of limited resources and ensure services and supports for everyone. This is critical given that Tioga County has no hospital, no pediatric specialists, and only one part-time dentist who accepts Medicaid. Regionally, the Rural Health Network of South Central New York, a nonprofit organization based in adjacent Broome County, spearheads this type of coordination. The network brings together health care and social service leaders in its three focal counties—Tioga, Broome, and Delaware—and supports regional projects that involve other Southern Tier counties. These projects educate local citizens about wellness practices and healthy lifestyle options; build infrastructure that supports physical activity, such as biking and hiking trails; and improve access to health care services. The nonprofit community also plays a strong leadership role. The Tioga County Non-Profit Network meets quarterly to exchange ideas and information to serve residents’ needs. Representatives from approximately 20 groups attend these meetings, which are facilitated by the head of the Tioga County (Cornell University) Cooperative Extension Service. These discussions often lead to collaborative approaches to local challenges. Opioid abuse is one area where nonprofit leadership has been essential. Tioga County Allies in Substance Abuse Prevention holds quarterly panel discussions with parents, law enforcement personnel, and mental health counselors on this issue, and operates a coalition of volunteer representatives from local school districts, nonprofits, and the general community, including parents. In addition, several large employers actively invest in community health, which they view as vital to maintaining their workforces. These public and private organizations offer a range of health benefits, health education, and other opportunities to help Tioga residents pursue personal health improvement. Lockheed Martin is one of the largest and oldest employers of Tioga County residents, with health benefits that include not only comprehensive health coverage but also a robust employee health program that offers free flu shots, free onsite health screenings, and access to walking paths and weight management groups. These benefits are available to employees and their family members. Crown Holdings, Inc., which manufactures metal packaging products, is another large employer with an employee health care package that covers medical, dental, and vision care, and prescription drugs; a tuition assistance program for employees who wish to return to school; and disability coverage under an accident and health plan. One of the largest public employers in the county, the Owego Apalachin Central School District, is unionized and offers its employees excellent health benefits. Another large employer, Tioga Downs Casino, is also unionized and offers health benefits. In Tioga County, researchers found a pattern of cooperation among health care providers, planners, educators, and other decision makers. Leaders here see collaboration as critical to ensuring that their communities thrive. Collaboration is pervasive across sectors, organizations, and programs within the county, and with other counties in the region. As mentioned, the Rural Health Network of South Central New York serves as a forum for sharing ideas and information, coordinating grant-seeking activities, and reducing funding competition for area health initiatives. This high level of cooperation across counties helps ensure that everyone gets the services they need, especially in lean times. There is also significant collaboration among nonprofits, government agencies, and health and advocacy groups. For example, Family Health Services for Tioga Opportunities, Inc., a nonprofit safety net service provider, collaborates with the county health department on testing services; with the extension service on breastfeeding support groups; and with Lourdes Hospital on pregnancy education for young women. Another project with nearby primary care practices helps community members get transportation for their medical appointments. In addition, CASA-Trinity, an alcohol and substance abuse prevention center, pools the efforts of professionals and citizens, and the Tioga Health Coalition promotes health throughout the county. Again, these efforts reflect an orientation toward sharing resources of time and expertise in ways that address local problems in the absence of financial resources and outside support. Collaboration has made dental care available in the county. Although dental care for children of low-income families is a critical need in Tioga County, the state does not provide funding for it. The local response was to create a mobile dental services program that employs a van equipped to provide basic dental services to schoolchildren around the county. The dental division of Tioga County Public Health worked with school administrators to get the program up and running. Adults can also get dental services through the van before and after school and during school vacations. 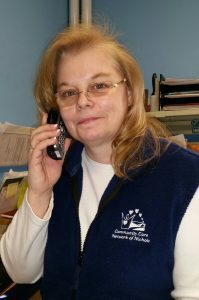 Tioga County Public Health similarly supports a mobile program that provides mammograms to low-income women in outlying parts of the county. Because Tioga County has so few health care providers, regional sharing of health care resources is crucial. Residents have access to high-quality health care from providers in neighboring counties, including level-one and level-two trauma centers, as well as satellite outpatient clinics that operate in and near Tioga County. Traveling outside the community for health care is typical, but, for most people, not onerous. Within the county, researchers found a strong pattern of resource sharing among social services and health providers. For example, the newly renovated Tioga County Health and Human Services building is perceived as the area’s most valuable safety net resource, housing agencies providing services related to health care, mental health, employment, food stamps, and other assistance. Because these services are all located in one building, it is much easier and more convenient for residents to get the assistance they need. What’s more, that assistance is better coordinated among the various service providers. Dot Richter, executive director of the Community Care Network of Nichols. Photo © Mary Beth Jones, 2017. Volunteerism is another form of resource sharing that plays a key role in Tioga County. Residents here take pride in helping each other through extensive volunteer networks. In fact, people interviewed during the field work consistently cited volunteer-led grassroots initiatives for solving local challenges—such as lack of access to transportation, food insecurity, and substance abuse—undertaken because of limited resources and outside assistance. Services such as conflict mediation, arbitration, court assistance, fire and safety support, emergency response, and youth leadership are frequently provided by volunteers instead of through tax dollars. Nonprofit groups, schools, and employers all actively encourage and support community volunteering. Nonprofits in Tioga County value their volunteers; many organizations provide support and training, while some provide insurance coverage. They are also mindful of the need to maintain an influx of younger volunteers to keep their organizations going. And county policy makers recognize that funding is essential to support volunteer programs so they can operate effectively. Volunteerism has been crucial to meeting public transportation needs. In 2014, the Tioga County government ended the public transit van service on which many residents relied, leaving them with no way to get to medical appointments or pick up prescriptions. (New York State had reduced its transportation subsidy, making the service unsustainable.) In response, citizen groups sprung up across the county to replace the van service. These all-volunteer groups, including the Community Care Network of Nichols and Neighbors Helping Neighbors in Richford, provide transportation to people who need it. Others are stepping in and sharing resources like vehicles and fuel. Food insecurity and nutritional risk are also challenges for low-income families in parts of the county. Other than one or two well-run mom-and-pop food stores in each of the county’s six villages, two supermarkets on either side of Owego serve Tioga’s residents. Over the past 15 years, these markets have changed ownership a few times, with each change resulting in a reduced variety of foods available for residents. Local farms and community gardens offer fresh produce at outdoor farmers’ markets during the growing season, and many of these markets accept food stamps. Similar to the response that the public transportation crisis elicited, several organizations stepped up to provide nutrition assistance, including the Open Door Mission, Tioga County Rural Ministry, the Anti-Hunger Task Force, and Meals on Wheels. These organizations are largely dependent on volunteers. In addition, Tioga County citizens have organized backpack and lunchbox food programs for low-income schoolchildren. Local citizens and social service professionals have started a range of service organizations that depend largely on volunteer and in-county support. These groups include the Finger Lakes Parents Network, for parents with developmentally disabled children; the New Hope Center, a resource center for victims of domestic violence; a Healthy Neighborhoods program that provides free in-home safety assessments; the Bridge, a network of churches that helps educate congregation members on community issues; and Reality Check, a youth tobacco-control project. Throughout Tioga County, concern for the health and well-being of children and youth is evident. Two family resource centers in Tioga County offer parenting education and host parent-child activities. Resource center staff are also available for home visits to provide further support for low-income parents. In addition, use of the Supplemental Nutrition Assistance Program (SNAP) is on par with the national average (76 percent and 78 percent, respectively). Services include nutrition education for low-income women who are pregnant or already have children. These supports may contribute to Tioga County’s better-than-expected rates of infant mortality and low-birth-weight births. Concern for youth safety and well-being is also apparent in the countywide push for tobacco-free establishments and spaces such as parks and community fairs. Tioga County may be lacking in financial resources and other advantages, but it is rich in other critical health-promoting assets: a culture of collaboration and volunteerism, resilience and resourcefulness in the face of adversity, an ability to respond quickly to new challenges, and a strong sense of community pride and altruism. The region’s history of pulling together to recover from natural disasters may have helped strengthen social cohesion. Partnership and pooling of resources are evident both within Tioga County and across the Southern Tier region, where communities work together to address issues such as food insecurity and transportation. Particularly noteworthy in Tioga County is the tradition of volunteerism, which seems to be part of the way of life here. Volunteers often fill significant gaps in government-funded services addressing issues ranging from transportation to emergency response and safety to youth leadership to food insecurity. Nonprofits, schools, and employers all support volunteer programs and activities. Employers support community health by providing a range of health benefits, including personal wellness services. This is particularly important given that Tioga has no hospital of its own and a shortage of care providers. With good health benefits, residents are better able to get the health care services they need from providers outside the county. These assets, though difficult to measure, make for a community where people feel connected to each other, look out for each other, and help each other. They also contribute to a community where health, in many ways, is better than expected—and has the potential to become even better. American Community Survey, 5-Year Estimates, 2011–2015, Selected Housing Characteristics. DATA USA. 2017. Economy. October 3. Holmes, G. Mark, Nancy M. Lane, Thomas A. Arcury, Michael L. Schwalbe, Randy Randolph, John Frank, Sharita Thomas, et. al. 2018. Identifying Bright Spots in Appalachian Health: Statistical Analysis. Washington, D.C.: Appalachian Regional Commission. Tioga Opportunities, Inc. Child Food Insecurity, 2018. See Table 22 in the data appendix at the end of this case study for a full list of actual health outcomes for Tioga County compared with predicted outcomes. For details on the outcome measures, see the data files accompanying the report Identifying Bright Spots in Appalachian Health: Statistical Analysis. Table 20 in the Tioga County data appendix at the end of this case study provides a quantitative profile of county characteristics. For a full explanation of the methodology, see Appendix B: Research Approach. For a list of key informants interviewed for this case study, see Table 21 in the data appendix at the end of this case study.